CalAgrAbility attended the Latino Farmer Conference in Fresno, CA, on November 3. Workshops were offered on access to farm financing programs, soil health, drought farming, and marketing. Although this was the conference's first year and 125 farmers were expected, more than 325 people attended. CalAgrAbility consumer, Rosendo Ramirez, attended the conference with his wife. CalAgrAbility staff member Cody Thao attended Mental Health First Aid Training in Woodland, CA, on November 4 and 5. Instructor Donna Bousquet discussed the basics of mental health first aid using the acronym ALGEE (Approach, Listen, Give, Encourage, and Encourage). Cody is now certified to "provide initial help to people experiencing mental health problems such as depression, anxiety disorders, psychosis and substance abuse disorders." Cody Thao attended SAFE Talk Training in Woodland, CA, on November 6. Instructor Donna Bousquet discussed how to properly talk about suicide with another individual who may be considering suicide, using the acronym, TALK (Tell, Ask, Listen, and Keep safe). Cody Thao is now certified in suicide alertness. CalAgrAbility attended the Farmworker, Women's Health, Safety, Employment, Education and Environment Conference in Visalia, CA, on November 6. One thousand people attended the conference and many took interest in AgrAbility's arthritis fotonovela. Dr. Sergio Aguilar-Gaxiola (UC Davis) delivered the keynote speech on depression in the agricultural community. Depression can cause accidents in agricultural settings: agriculture is a dangerous industry and a farmer or farm worker suffering with depression may not be focused on work and safety precautions. CalAgrAbility attended A Discussion on Family and Diversity Dinner by the San Joaquin Pride Center in Lodi, CA, on November 14. The presenters discussed LGBTQIA awareness in the agricultural community. CalAgrAbility staffed a booth at the Farmer Veteran Stakeholder's Conference in Sacramento, CA on November 17, 18, and 19. 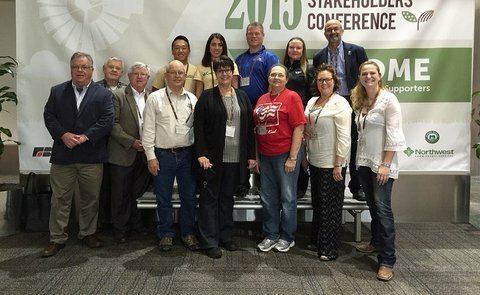 The conference held workshops on creating new state chapters of the Farmer Veteran Coalition, collaborating with government partnerships, farming as healing, successful past cases, and training for beginning farmers. CalAgrAbility enjoyed sharing lunch with SRAP and NAP representatives.